Telemedicine has been used in a wide array of clinical applications to help eliminate geographic barriers and improve access to services that would often not be otherwise consistently available. 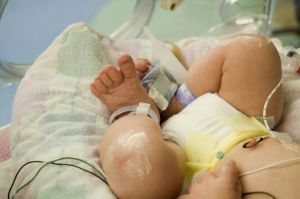 To see if this technology is feasible for use in the field of neonatal medicine, neonatologists at the Children’s Hospital in Los Angeles, CA implemented a study to describe the use of a wireless, mobile, robotic telecommunications system in the Neonatal Intensive Care Unit (NICU). The study utilized 304 patient encounters with 46 preterm and term new born infants, also known as neonates, in a level IIIa NICU. An “on-site” bedside neonatologist (ONSN) and an “off-site” neonatologist located at a distant location (OFFSN) evaluated selected demographic information, laboratory data and clinical and radiological findings of the subjects. “The [off-site neonatologist] used a commercial wireless, mobile, robotic telecommunications system controlled from a remote site,” the researchers described. They also stated that, “the two physicians were blinded to each other’s findings” and agreement rates of the evaluations between the on-site and off-site neonatologist were compared. A control was also set using the agreement rates between two on-site neonatologists using the same protocol with 39 patient encounters. The dependability and timeliness of data transmission were also assessed. According to the study results, “excellent or intermediate-to-good agreements were noted for all but a few physical examination assessments between both the on-site and off-site neonatologists and the two on-site neonatologists. Poor agreements were found for certain physical examination parameters (breath-, heart- and bowel-sounds and capillary refill time) with or without the use of telemedicine. The median duration of the encounters by the ONSN and OFFSN and the two ONSNs was similar. No complications associated with the use of the mobile robot were noted. It was concluded that the use of mobile, robotic telemedicine technology is in fact feasible for the NICU. The system used enabled remote neonatologists to accurately identify and assess the patients through the use of the mobile robot in the NICU without incident and the audio and video quality was noted as acceptable. The researchers stated that their next objective is to assess whether the use of this technology impacts clinical outcomes and health care costs. Garingo A, Friedlich P, Tesoriero L, Patil S, Jackson P, Seri I.